“The Relativity Song” may never reach number one on the Billboard Music Chart. Smart as they are, lyrics like“It's glor'ious and eerie, this theory!/Its light is shining on me!/I see time dilation and feel the elation/Of relativity”*â€”set to the tune of“Fathoms Below” from the film The Little Mermaidâ€”may never attract the attention of the Grammy nominating committee. But what this and other physics-related songs do to stimulate students' brains and expose them to the lighter side of physics means more to associate professor and part-time songwriter Walter Smith than any award. Smith started writing physics songs a few years ago with his wife Marian McKenzie, a librarian at Haverford Friends School.“At some point in the semester, students start to drift off,” he says.“I wanted to refresh their minds and show them a different way of thinking about physics.” Earlier, he had presented to his class a poem he'd penned about capacitors, and his students had been resoundingly enthusiastic. They were even more delighted when he performed his first song, about Danish physicist Hans Christian Oersted, with the help of his baritone ukulele. The reaction inspired him to create more songsâ€”some with his wife, some on his ownâ€”and his students were encouraged to contribute their own creations. “I wanted them to approach the material using other parts of their brains,” says Smith, who supports psychologist Howard Gardner's theory that each person has many different kinds of intelligence. Songs about physics, Smith believes, tap into the musical aspect of intelligence. 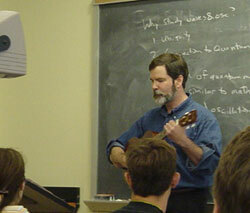 When he had amassed about 14 songs, Smith created a Web site, www.physicssongs.org, to make the works more readily accessible to interested parties both on and off campus. Today the site boasts more than 80 songs, 25 by Smith or his students, others by faculty and students at elementary and secondary schools and colleges across the country. He's also proud to have acquired some older physics songs from the 1940s and '50s written by former MIT researcher Arthur Roberts. Some years ago a visiting professor at Bryn Mawr College offered him a set of 78 RPM records that had been handed down from his father. The songs focused on the culture and society of physics, as seen by Roberts, an esteemed scientist and fellow of the American Physical Society.“These songs were an important social outlet,” says Smith.“He'd perform them at parties and compose overtures for events like the opening of the Oakridge Nuclear Reactor.” Roberts was also a pioneer in the field of electronic music. When using his tunes in class, Smith usually introduces them towards the middle or end of a lecture period, after students have been eating, sleeping, and breathing a major topic for several classes.“They perk up when I dig out the uke and start performing,” he says.“I try to get them to join in, but it takes a while for them to get used to the idea of singing in class.” He finds it's more effective to use songs in class if the professor performs them:“It helps students see you in a different role if you're willing to make a fool of yourself in front of them.” This especially benefits students who may be too shy to ask questions or admit they don't understand a concept. Many members of his class create their own songs to fulfill small independent projects and contribute them to Smith's site, and some are brave enough to perform their masterworks in class. The Physics Songs Web page has become well-known around campus and at schools such as Cornell University, and has encouraged fellow physics professor Suzanne Amador Kane and John Dougherty, assistant professor of computer science, to use tunes in their own classes. Smith receives submissions to the site every few months, and always welcomes new ditties extolling the wonders of waves and oscillations or magnetic monopoles. If you've got something to rival“Oh, you be the B field, and I'll be the E field/Let's dance through the cosmos, my lover!”**, send it to wsmith@haverford.edu.